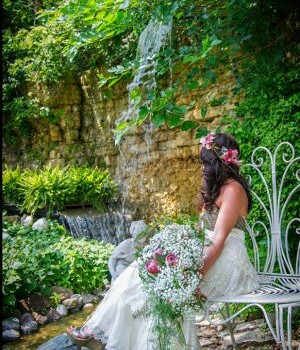 The White Pines Wedding Canyon offers outdoor wedding ceremonies in a beautiful and picturesque natural setting for couples who share a passion for the great outdoors. Guests find themselves surrounded by dramatic thirty-foot limestone walls draped with indigenous ivy and vines in shades of brilliant greens. Creative landscaping with ponds, waterfalls, bridges, and colorful flower gardens add the perfect touches to the park’s lush manicured lawns. The designers have gone to great lengths to enhance and not overwhelm the natural beauty by providing gazebos, pillars, arches, and other rustic iron works, stylishly placed throughout the Canyon, so couples can select a favorite site from a multitude of settings. More and more couples are choosing this non-traditional alternative to a church wedding. Imagine exchanging vows in this enchanting Canyon without a worry because the Wedding Canyon creators have taken into consideration all aspects of an outdoor venue and planned each detail accordingly. As the seasons change in the canyon so do the natural colors of the flora and fauna. Outdoor ceremonies are offered mid-May through the 3rd weekend of October each year. The Wedding Canyon is located on Pines Road just west of the entrance to White Pines State Park.